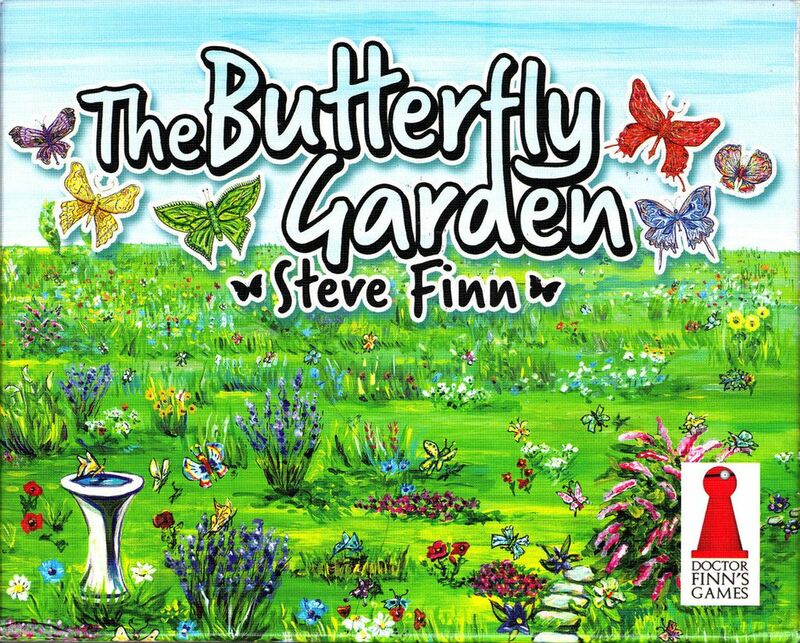 The Butterfly Garden is a game by Steve Finn, published by Doctor Finn’s Games. It is for 2-6 players. In this game, players take on the role of lepidopterists, or butterfly collectors. They will be trying to capture the most highly desired butterflies in their jars so that they can deliver them to their own personal butterfly gardens. Of course they’ll have to be careful, as their fellow collectors may try to sabotage their jars, releasing their butterflies back into the wild. In the end, the player that can create the best garden of butterflies, earning them the most victory points, will be declared the winner. To begin, each player receives a jar tile and a garden tile, placing them in front of themself. The butterfly cards are shuffled together and each player is dealt 3 cards each. The remaining cards are placed face down in the middle of the play area to form a draw pile. One card for each player is drawn from the butterfly deck and placed face up in a row beside the draw pile. This area is called, “The Field”. The delivery cards are shuffled next and are placed face down to the side of the play area. A certain number of cards are drawn from the delivery deck and placed face up in a row beside the deck. That number is equal to the number of players minus 1. However with only 2 players, 2 delivery cards are drawn and placed on either side of the delivery deck. One more delivery card is then flipped face up and placed back on top of the deck. This card is not available but will become available later. The score cards are set aside for the moment. Play now begins. The game is played in a series of rounds. Each round is divided into 3 different phases. Those phases are Establish Turn Order, Take Turns and Prepare for Next Round. The first phase is to Establish Turn Order. In this step players will pick a butterfly card from their hands simultaneously and then place it face down. Once everyone has completed this, all players will turn over their chosen cards at the same time. The numbers on each player’s card will establish the turn order beginning with the lowest number and going to the highest. The next phase is to Take Turns. In turn order, each player will take a series of steps in the corresponding order; Capture a Butterfly, Perform a Special Action, Add a Butterfly to the Jar and Deliver Butterflies to the Garden. To Capture a Butterfly, the player will choose a butterfly card from the field and add it to their hand. Once this has been done, they will Perform a Special Action, if they have any to perform. That is to say, if the butterfly card that they played in the first phase has a special action icon on it, the player now has the option of performing the corresponding action. This action could be to draw a butterfly card, to place a butterfly card from their hand into their jar, replacing it with a butterfly card from their jar. to deliver the butterfly card straight to their garden and score victory points for it or to draw the top butterfly card from the deck and add it to their jar. When they’ve completed the action, they will now Add a Butterfly to their Jar. They will do this by taking the butterfly card that they played in the first phase and moving it to their jar. They will turn the card sideways and tuck it under the side of the jar tile so that the types and amounts can easily be seen. It should be noted that a player’s jar can only hold 8 butterflies. If a jar ever has more than this amount, the player must immediately discard a butterfly card of their choice until 8 or less butterflies remain in the jar. Finally, the last step is to Deliver Butterflies to the Garden. To do this, the player discards butterfly cards from their jar that show the same butterflies that correspond with one of the delivery cards. It should be noted that the player is able to pay more butterflies than is needed to fulfill the delivery card. The fulfilled delivery card is then tucked under the player’s garden tile so that the victory point totals of each one can easily be seen. The final phase is to Prepare for the Next Round. In this phase a butterfly card is drawn from the deck and placed in the field. Delivery cards are drawn to replace those taken earlier in the round. The top card of the Delivery deck is then flipped over and placed on top, just like during setup. Unless the Delivery deck has been exhausted, a new round begins. The game continues until one of the game ending events happens. If the Delivery deck has been exhausted, the game ends. If a player reaches or passes the victory point goal, then the current round is completed. That goal depends on the number of players. Either way, players add up their victory points and the one with the most points is the winner. There aren’t a lot of pieces when it comes to this game. There are the Garden and Jar tiles that are given to each player, and then there are all the cards. The tiles are thick cardboard and have a really nice linen finish to them. The same is true of the cards. Needless to say, I’m a fan of the finish. I like the texture and how nice it looks on whatever it’s used on. The artwork on the tiles isn’t all that dramatic. The Garden tile has a few flowers at the bottom and a blue sky above, while the Jar tile has what looks like a Mason jar in a field of grass. The artwork looks hand painted and is quite nice. Most of the tile is covered with the phases of a player’s turn on the Garden tile and a list of special actions on the Jar tile. These are great references and serve double purposes which is also nice. The one bad thing about the tiles is that while it’s nice to have the references, the text covers about 3/4 of the tile and thus the really beautiful artwork is reduced to a smaller size. Fortunately, the cards don’t suffer the same fate. The artwork really shines on these and has plenty of room to fly free. Get it…butterfly…fly free. I’ll see myself out. Once again the hand painted look appears once more in all it’s beauty. Each card look beautiful. Even the backs of the cards have a nice design that doesn’t distract from the imagery. Thematically, the look and the feel are all there. Everything looks like it fits together quite nicely. Having played a prototype copy of this early one, I’m very happy with the way this all turned out. It far exceeded what I expected. The rulebook for this game is small but concise. It looks really nice and has lots of great pictures and examples. The book shows how setup should look and also includes an advanced setup that involves less luck. Each phase of the game is explained in great detail in a step by step process. The book is really simple to read through and is easy to understand. The best part is that it doesn’t take very long to read through. I think that the book does a great job at covering everything. I’m very pleased with the overall look and feel of the book. It gets the job done with style. It’s a definite improvement to the original rules. This game features a lot of different mechanics rolled up into one. It takes things like action selection and combines it with some hand management. It even has a nice pick up and deliver feel to it, even without actually using the mechanic. The game has a great theme that works quite well with the mechanics. Starting off the game has a bit of a luck based feel to it, however that has been mitigated with the advanced rules for setup. The game focuses on scoring points by collecting the right types of butterflies to fulfill the different delivery cards with. Of course you can overpay but you don’t want to waste any butterflies so that’s where the hand management part comes in. With several options available to deliver butterflies, you’ll be filling deliveries and scoring points fairly rapidly. Which means that you’ll be needing more butterflies to add to your jar. I like that certain butterfly cards have special abilities that can help you in various ways. I also like how nice that the game looks on the table. It’s a fun light weight card game that is family friendly. No need to worry about offending the grandparents or upsetting the kids with this one. It’s just a beautiful little filler style game that plays quickly and will delight players of all ages. It’s not a high strategy game so fans of those types of games may find this one a bit lacking. However for everyone else, I think it’s good to go. This is one that could be easily placed into a small drawstring bag and carried virtually anywhere. With it only being a deck of cards and a few cardboard tiles, it’s very portable. Of course, you’d have to remove it from the box to do that. This is one that I feel works for just about anyone. With a short play time, it makes a great filler and could be played with your co-workers on your lunch break. The look and feel of the game should even appeal to the ladies in your office. Overall, I find this to be a great little game that I highly recommend. 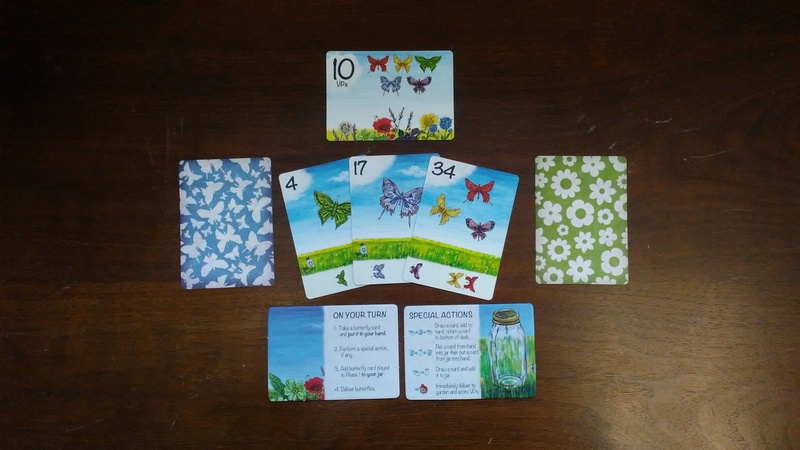 The Butterfly Garden is a card game about collecting the most beautiful butterflies for your garden. The game doesn’t take too long. Most game sessions last around 20 minutes or so. The artwork is really beautiful and looks great on the table. I do wish that the tiles had more artwork and less text on them, but that’s just a personal preference. The rulebook looks great and covers all the rules quite nicely. The game itself is a lot of fun and makes a great filler that can be played virtually anywhere. The fast game time and family friendly look makes it one that should appeal to almost anyone. It can be played with both old and young, as well as both males and females. It has a good bit of luck but that can be changed with a slight modification supplied in the rulebook. Fans of high strategy games might be left a little cold with this one, but everyone else should really enjoy it. This is a game that I love to play and look forward to playing it many more times. I highly recommend this game. See if you can catch yourself a copy while it’s still available. For more information about this and other great games, please check out Doctor Finn’s Games at his site. This entry was posted in Reviews and tagged board, board games, butterfly, butterfly garden, card, card games, doctor, doctor finn's games, finn, finn's, games, garden, steve, steve finn. Bookmark the permalink.